Historic Curran Hall is conveniently located in Little Rock’s downtown historic district and is within walking distance of the River Market District. Built in 1842, Curran Hall is the city’s only restored antebellum home open daily to the public. It houses the official Little Rock Visitor Information Center and is the Mayor’s Reception Hall. Managed by the Quapaw Quarter Association, a local nonprofit preservation organization, Curran Hall welcomes weddings, bridal parties, photography sessions, meetings, intimate gatherings, receptions, sit-down dinners and buffets, hosted both inside the lovely historic home and on beautifully landscaped grounds maintained by the Pulaski County Master Gardeners. The Little Rock Visitor Information Center at Curran Hall is open 9 a.m. to 5 p.m. Monday-Saturday, and 1-5 p.m. on Sundays. Stop by during those hours to tour the house and garden. 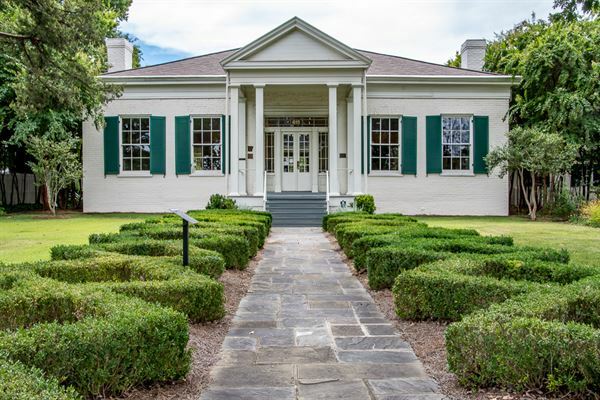 Curran Hall welcomes weddings, bridal parties, photography sessions, meetings, intimate gatherings, receptions, sit-down dinners and buffets, hosted both inside the lovely historic home and on beautifully landscaped grounds maintained by the Pulaski County Master Gardeners. Special Features: Curran Hall welcomes weddings, bridal parties, photography sessions, corporate meetings, workshops, intimate gatherings, receptions, sit-down dinners and buffets, hosted both inside the lovely historic home and on our award-winning landscaped grounds.